Plastic has only been around for 60-70 years but it’s already begun to negatively impact the natural environment and create problems for plants, wildlife and even human population. As plastic is composed of major toxic pollutants, it has the potential to cause great harm to the environment in the form of air, water and land pollution. Plastic pollution in the sea is set to treble in the next 10 years, and by 2050 the oceans will contain more plastic than fish by weight. This is a massive problem because the accumulation of plastic in the environment adversely affects wildlife, humans and the environment itself, especially in waterways and oceans. Marine animals are affected through entanglement, direct ingestion of plastic waste, or by exposure to chemicals within plastics that causes damage to their biological functions. Sea birds are affected as well, with studies showing that 90% of sea birds have some sort of plastic in them. Humans are also affected by plastic pollution. In the UK alone, more than 5 million tonnes of plastic are consumed each year, which can disrupt hormone levels. Plastic reduction efforts have occurred in some areas in attempts to reduce plastic consumption and pollution and promote plastic recycling, but it’s estimated that only 24% of all plastic actually makes it into recycling systems. That leaves a remaining 3.8 million tonnes of waste, destined for landfills. Between 10 and 20 million tons of plastic ends up in our oceans every year. More plastic is being thrown or washed into the ocean at a rate much quicker than what it is breaking down. Plastic as a material is photodegradable, which means that it breaks down into smaller pieces when exposed to sunlight, and because the temperature they are exposed to in the sea is a lot lower than that on land, the breakdown process takes a lot longer in the marine environment. It’s estimated that 5.25 trillion plastic particles are currently floating around in world’s oceans. As this is such an important issue, we were very interested to discover the top influencers, brands and publications discussing plastic pollution on social. What follows is the top 50 in each category, including a network map of the online conversations. 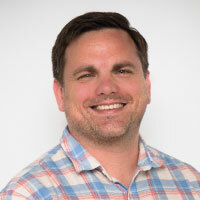 There are a wide variety of different influencers that you can engage with so it is good to focus your engagement on certain personas that you feel will best communicate your message to your target audience. Typically industry experts, micro-influencers and everyday influencers are easier to engage than the macro influencers. 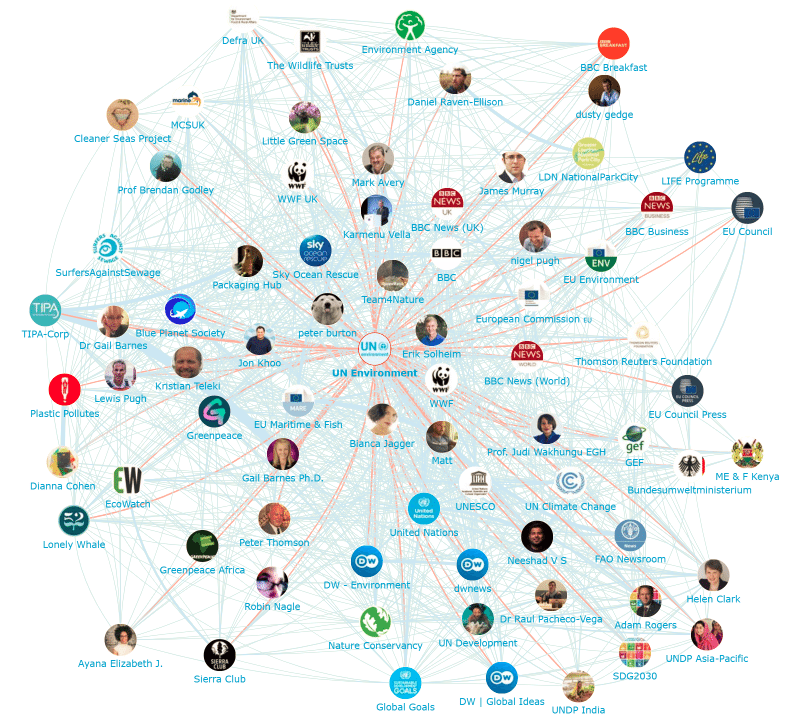 Below is a list of the top 50 plastic pollution influencers. If you want to see who ranks from 1-100 be sure to download the full report by clicking the download button below! 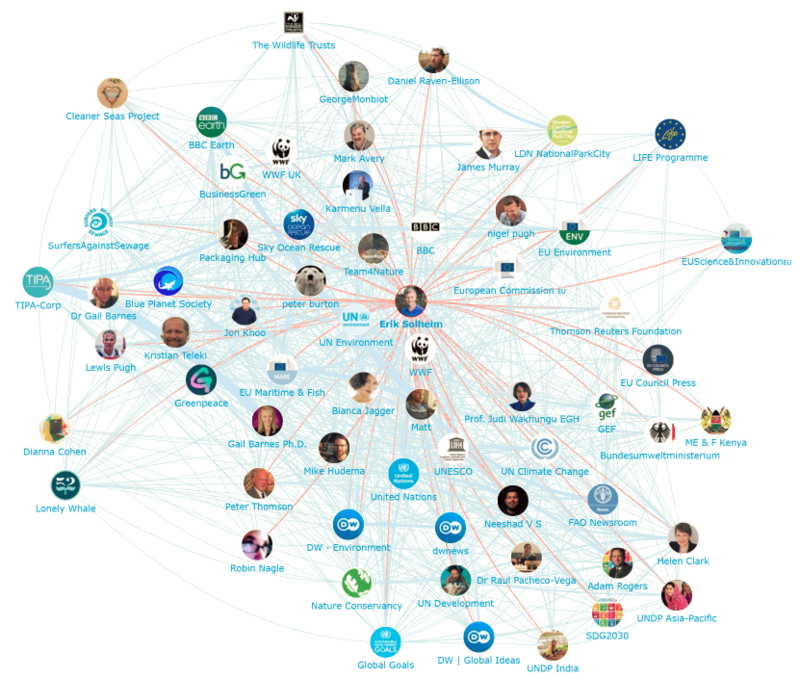 Below you can see a network map of the online plastic pollution conversations showing the number two influencer Erik Solheim at the centre. This map was created with our Influencer Relationship Management software (IRM). Be sure to click on the map to enjoy the full size network diagram in greater detail. Below is another network map of the plastic pollution conversation showing the number one brand UN Environment at the centre. If you are interested in learning more about identifying, managing and engaging with influencers click here to get in touch! Below is a list of the top 50 plastic pollution brands. If you want to see who ranks from 1-100 be sure to download the full report by clicking the download button below! Below is a list of the top 50 plastic pollution publications. If you want to see who ranks from 1-100 be sure to download the full report by clicking the download button below! Disclaimer: As ever with these lists, it must be stressed that the ranking is by no means a definitive measurement of influence, as there is no such thing. The brands, individuals and publications listed here are undoubtedly influential when it comes to driving discussion around plastic pollution. The PageRank based methodology we use to extract influencers on a particular topic takes into account the number and quality of contextual references that a user receives. These calculations also take into account a user’s relevance (number of tweets on topic), reach (number of followers) and reference (how often they are referenced by other influencers). If you want to learn more, please read our article that outlines How to identify your target influencers. 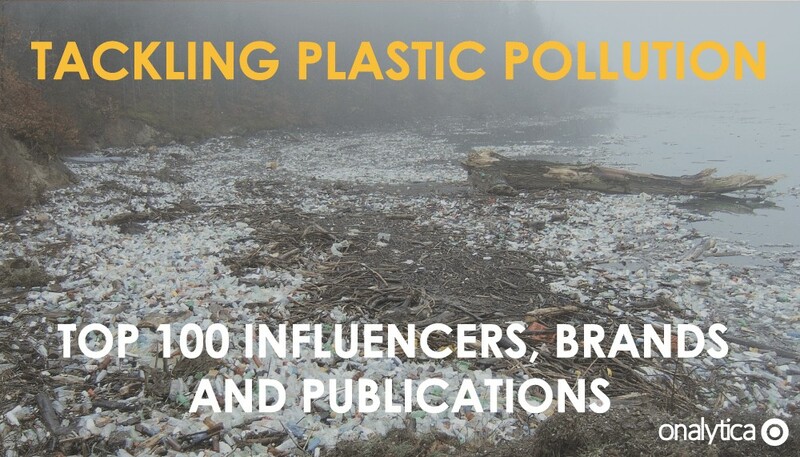 Download this free report which reveals the top influencers, brands and publications discussing plastic pollution.